Alyogne Huegelii is a spectacular flowering shrub that is native to Western Australia. 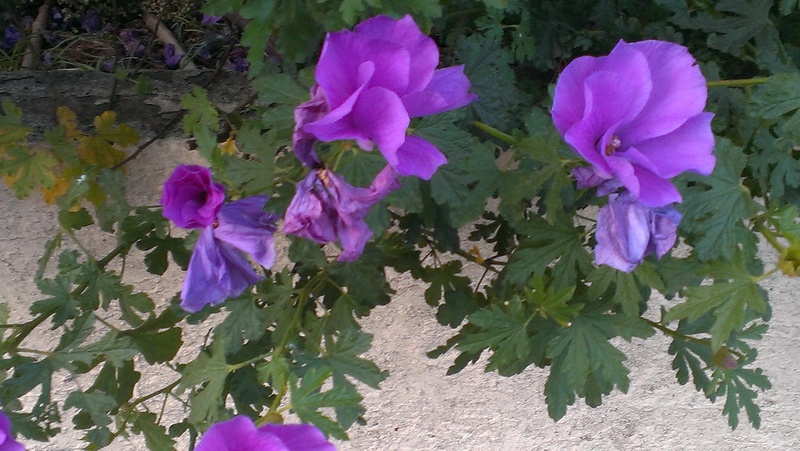 It is drought hardy but blooms profusely, and this very much explains its popularity in gardens here in Adelaide. There are a couple of these shrubs flowering spectacularly in my neighbourhood at the moment. 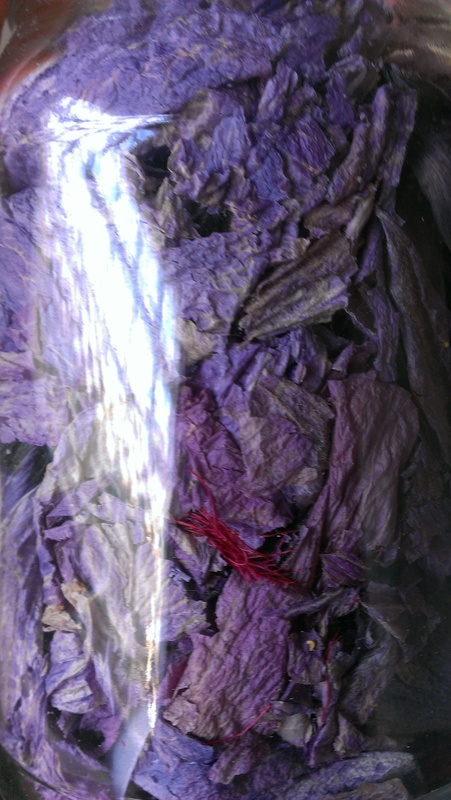 One of the things I really like about natural dyeing is the fact that you can enjoy flowers, gather them as they fall or pass their best, and have the joy of the flower as well as your dyepot. So I have been stopping by to collect fallen flowers from the footpath and the gutter, and pulling withered blooms that will not re-open. I crammed the dried petals into my jar along with some vinegar, foil, water and a woolen sample card. For those who are not familiar, this is India Flint’s Stuff, Steep and Store process. 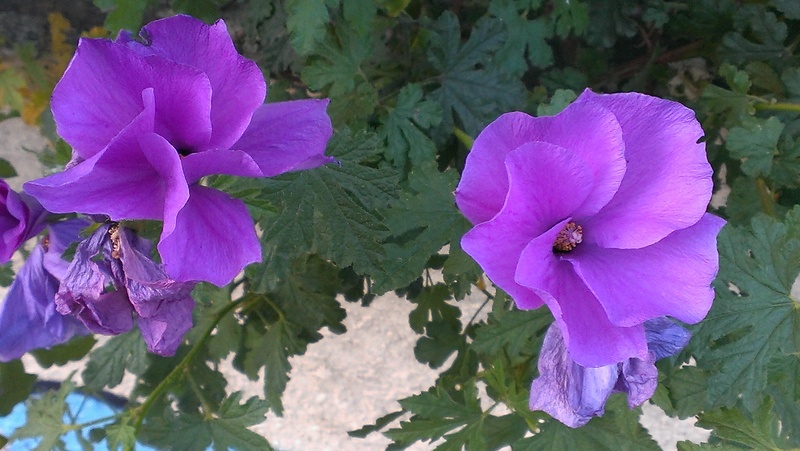 I have no idea if these flowers will yield dye–they are from the same plant family as hibiscus (and hibiscus petal yield dye)–so they do seem promising–but they are free and readily available and there is nothing but time to be lost by trying them out. I might learn something! 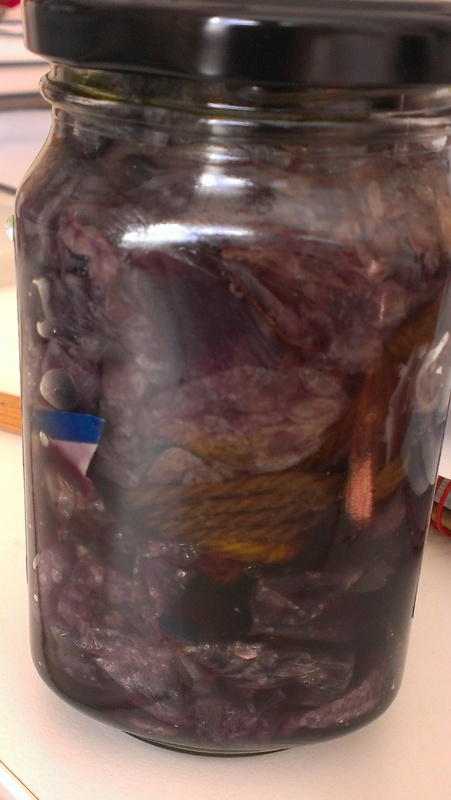 After cooking, I had a deep purple dyebath in my jar. So I gave it a label, added it to my collection, and now we wait. It belatedly occurred to me to check my reference books. The Handweavers and Spinners Guild of Victoria’s Dyemaking with Australian Flora (1974) reports that they achieved pink-fawn using cream of tartar as a mordant (I haven’t heard of cream of tartar being used without alum, so I have learned something already). They also achieved green and pale lemon with chrome, which I am not prepared to use. My sample card has alum-mordanted and rhubarb-leaf mordanted sample yarns, as well as an unmordanted sample–and the jar contains aluminium foil. Joyce Lloyd and India Flint’s books are silent on the matter. So–we’ll just have to see what happens. 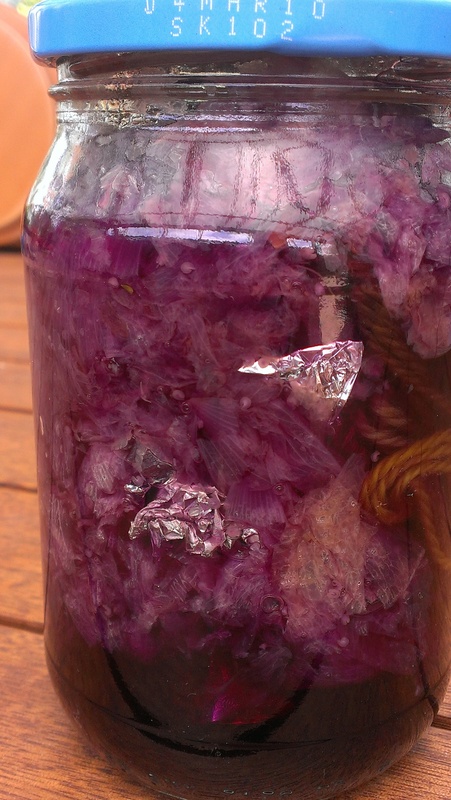 I later decided on an alkaline jar, since hibiscus dyes are ph sensitive, and created another. It leaked green liquid when I heated it, but the jar as a whole doesn’t look green (yet). Oh. And, we have moths. It is a bit hard to tell from your pictures but I think we have that over here in Melbourne as well, known as Native Hibiscus. I will be interested to see if it yields much colour. It grows like a weed, lovely bushy plant. It comes in white as well but is rarer. Lovely color on the flowers. Why do moths make me squirm? Eek! Thanks! I don’t know why moths make you squirm! Lucky you are not coming to visit–they are frisking about flapping their wings very audibly (I think that is mostly the males). 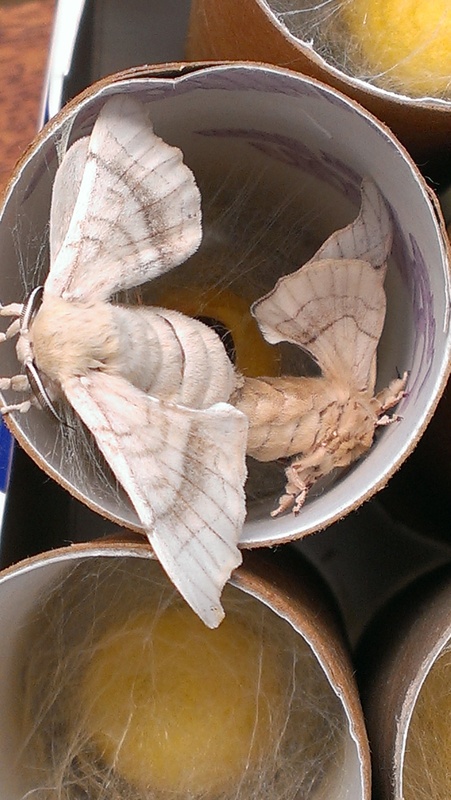 I had no idea that silk moths were so beautiful!! Will you let them go free? They are really delicate and lovely, aren’t they? I don;t know whether it would make their lives better to be out of doors. They can’t eat or fly, so they would likely be prey pretty quickly. But intuitively it seems the sunshine and air might bring pleasure, even for a moth. perhaps I should! We now have a LOT of moths… but have had gale force winds and hail and rain overnight. What to do?